The Wagner Power Painter Plus with Optimus Dual Tip Technology is a hand held sprayer designed for the home owner to speed up painting projects up to 3 times as fast as a brush. It uses high speed piston pump technology in conjunction with the tungsten carbide Optimus Dual Tip to provide a professional fan shaped pattern preferred for achieving the best, most even finish. Material can be sprayed from either the 1.5 quart cup or the 6 foot remote suction tube to draw directly from the can for larger projects. To see how this new technology works CLICK HERE!! 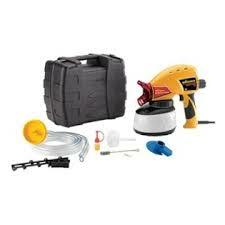 The Optimus line of sprayers from Wagner comes in 4 different models. They are the Project Painter, Power Painter, Power Painter Plus, and Power Painter Max. This model, the Power Painter Plus with Optimus is on the higher end of the line. It comes with 2-speed settings and a hard case for easier storage. Also like the Max model it comes with a 6 ft suction hose for spraying straight out of the can, and a larger 1.5 quart cup.